Our center(s) proudly use(s) Learning Genie as a convenient way to communicate and share information with parents. 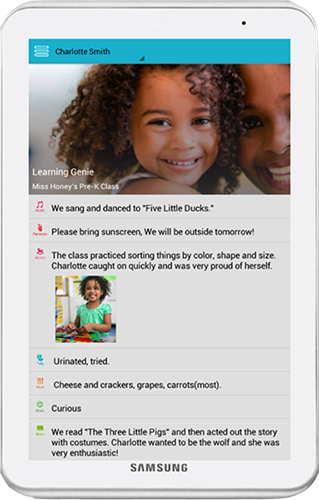 Our teachers send daily reports via the Learning Genie app, which includes photos of your child, links to songs and books used in class, important reminders, updates on daily activities in the classroom and developmental portfolios for each child. Parents will receive their child’s information daily via email, but will also have the opportunity to access it in real time through the Learning Genie Parent App on any mobile device (Android or Apple). The Learning Genie program is private, secure and easy to use! We look forward to sharing your child’s magical moments with you!